Mrs. Suchitra Jongchansittho, TAT Deputy Governor for Tourism Products and Business, said the latest edition of the Amazing Thailand Marathon Bangkok 2019 is set to become the top event of its kind by year three. “Organising world-class marathons in any capital city is challenge. However, with proper resourcefulness, Thailand stands to grow in stature on the global marathon map. For TAT holding any world-class marathon in Bangkok is a must to showcase the country’s accommodation, transport and safety advantage,” she added. 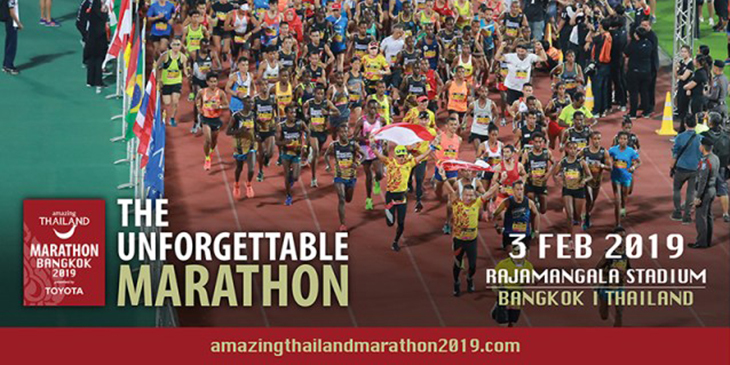 With over 25,000 runners, including 5,000 from around the world, TAT expects that the Amazing Thailand Marathon Bangkok 2019 event will help generate an estimated over 500 million Baht in tourism-related revenue for Thailand’s sustainable economic growth. The event showcases its unique city-centric layout that takes runners, depending on their race distances, past some of Bangkok’s historical landmarks; such as, the Victory Monument, Equestrian Statue of King Rama V the Great, and Rama VIII Bridge before heading to the same finish line at Democracy Monument. There will be Thai cultural food for runners at the finish line, an expo featuring 70 outlets of sporting items, and varieties of merchandise goods and entertainment activities.